Also known as On the Road to Bataan. 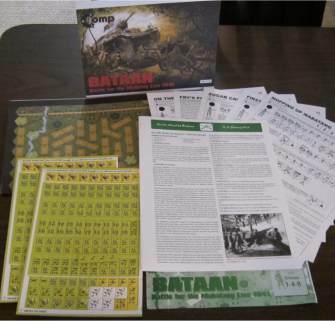 1st Edition (Bataan: Battle for the Mabatang Line, 1941), 2011; 2nd Edition (Mabatang Line), 2016. 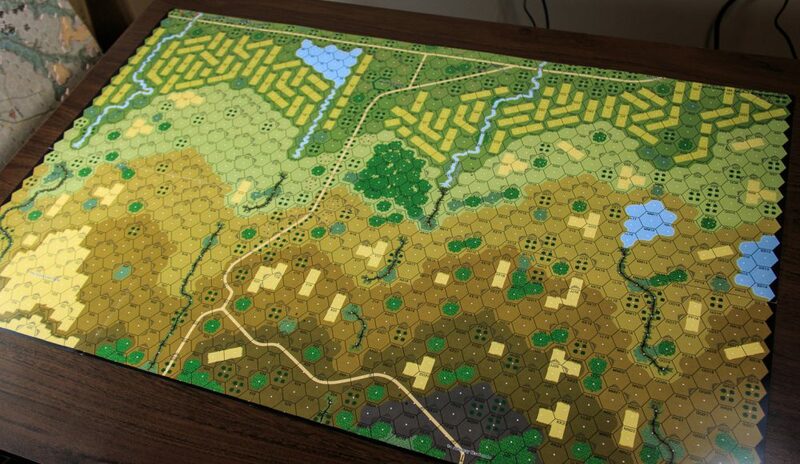 23" x 35" historical map, 4 pages rules, 8 scenarios, 2 duplicate sets of 148 die-cut counters. 2nd Edition (Mabatang Line) contents: 4 12" x 18" heavy paper glossy map panels, 2 duplicate sets of 148 die-cut counters, 4 pages rules, 8 scenarios, IIFT play aid (on back of folio). Bataan: Battle for the Mabatang Line (hereinafter simply BML) is a somewhat smallish HASL that depicts fighting on the Bataan peninsula between Fil-American and Japanese forces in the Philippines in early 1942, when the Japanese assaulted the Fil-American so-called Main Battle Position (i.e., defense line, sometimes referred to as the Mabatang-Mauban line or the Abucay-Mauban line). Specifically, BML covers fighting around the village of Mabatang, a tiny village around which was anchored the eastern end of the Main Battle Position, defended by the 57th Regiment of the Philippine Division (Philippine Scouts). These American-led Filipino regular forces were the elite among the Fil-American troops on Bataan. The territory they had to defend, unlike the western end of the line, dominated by rugged jungle, was characterized more by swamps and rice paddies. If the bibliography included with the module is any indication, the module may be lightly researched (it lacks, for example, two of the three key works on the campaign, and also doesn’t even mention the unit history of the 57th Regiment: Olson, John E [assisted by Frank O. Anders], Anwhere, Anytime: The History of the Fifty-Seventh Infantry (PS), privately printed, 1991). There are also errors in the historical material, such as repeatedly listing General Richard Sutherland as commander of the Provisional Tank Group when he was not. Sutherland was MacArthur’s notorious chief of staff; Col (later Brigadier General) James Weaver commanded the Provisional Tank Group. 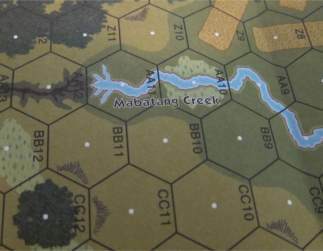 The map in BML seems loosely based on the actual historical terrain, although oddly enough, the village of Mabatang itself is missing (seemingly replaced entirely by shellholes). The artwork is decent, though flawed by Critical Hit’s reliance on terrain-stamping (using the same single-hex woods graphic over and over and over again). It’s nice to see the many rice paddies (rare on ASL maps). 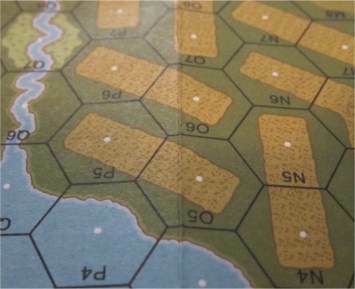 No fortifications appear on the map (and the scenario-provided fortifications sometimes seem insufficient to represent this prepared defensive line). 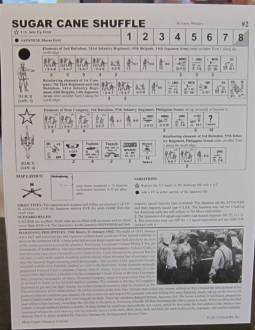 A four-page rules booklet is included, but essentially there is just one page of rules, and they are simple, meaning that players do not have to absorb a number of campaign specific rules before playing. Some of these rules are to explain counters on the small countersheet included with BML. Unlike a number of other recent Critical Hit products, BML actually comes with counters that are not primarily duplicates of existing counters. 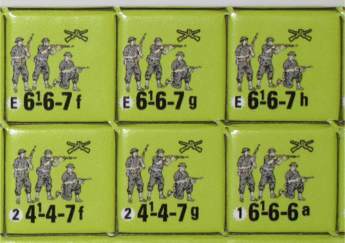 Most notably, BML introduces counters specifically for the Philippine Scouts, which are basically equivalent to Elite American squads, except with a lower smoke grenade factor. 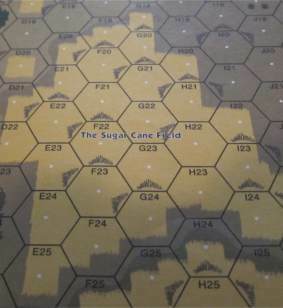 The countersheet also includes counters for lower-strength DCs made of TNT, as well as counters representing carabao, the Filipino water buffalo, used as a beast of burden (and, in this campaign, quickly eaten by the starving Fil-American forces). 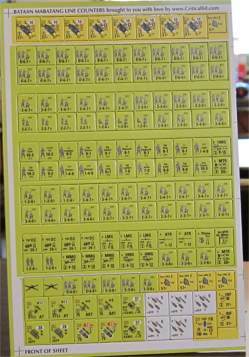 Also included are some Japanese AFV turret counters for the Type 89 (A and B) tanks; these are welcome because they show where the off-center RMG is so that players don’t have to constantly try to figure out its location). Oddly, 60mm mortar counters are provided, even though (because of lack of ammunition), these were weapons that were not used in the campaign. BML contains no campaign game, which is a shame, because the fighting for the Mabatang position occurred over several days, with both sides feeding in reinforcements, and would have made an excellent subject for a campaign game. Instead, it contains a mere 8 scenarios. Half the scenarios are large; the others are divided between small and medium in size. Three scenarios feature OBA; two scenarios use Night rules, while two scenarios utilize Air Support. The Japanese are on the attack in 6 of the 8 scenarios. 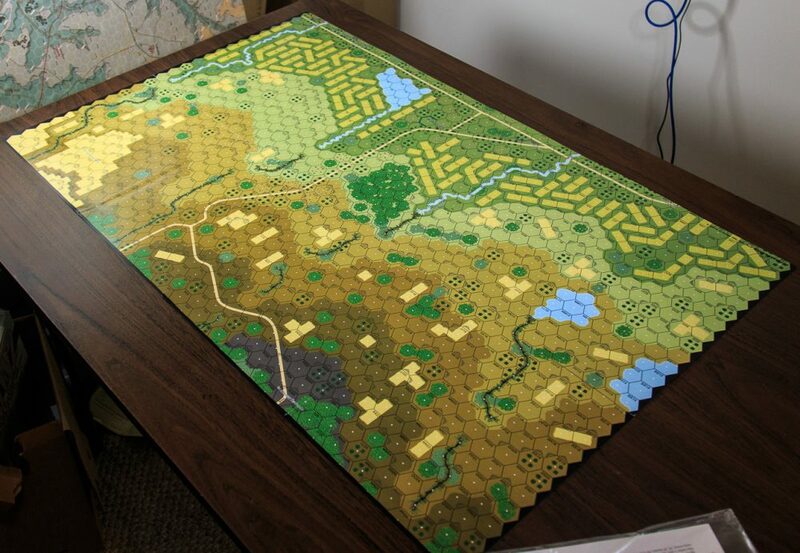 One scenario, BML#8 (On the Road to Abucay) utilizes the whole map; the other scenarios only use portions. Overall, it seems like a good mix of scenarios, with a number of opportunities for meaty but manageable PTO action on a historical map. Several of the scenarios look interesting. MBL#1 (Probing the Mabatang Line) seems like a solid medium-sized effort, with both sides getting some toys to play with. 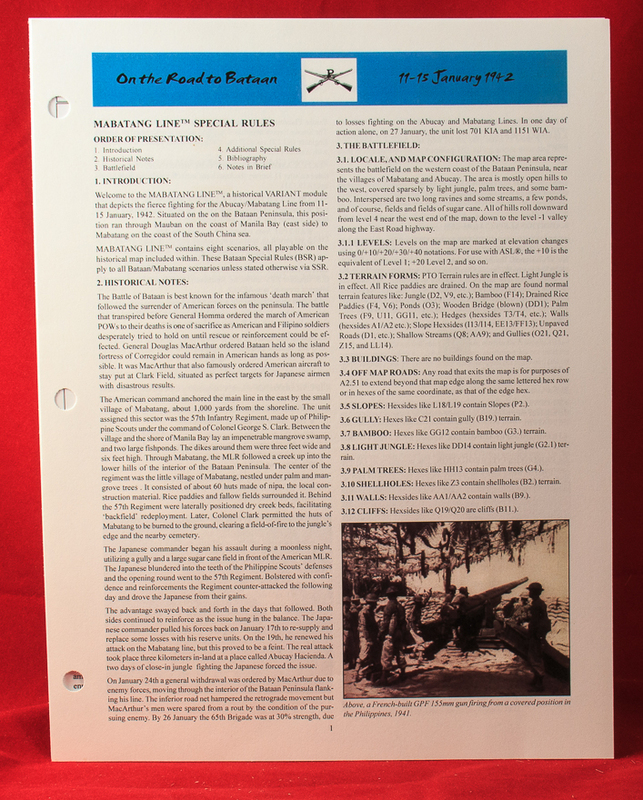 MBL#3 (Fry’s Philippine Scouts) depicts a rare (for this module, anyway) Fil-American counterattack against a Japanese penetration. 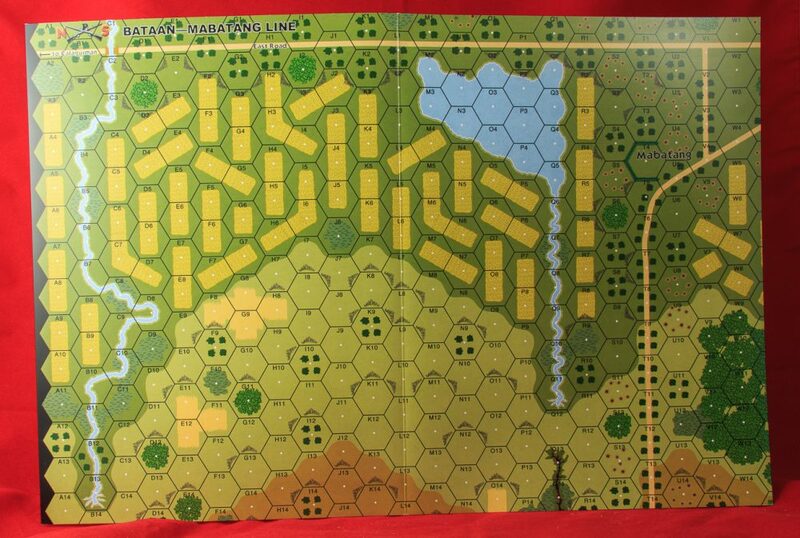 MBL#6 (Mopping Up Mabatang) depicts a large Japanese attack, with considerable armor support (potentially up to 9 tanks), against the Fil-American lines. 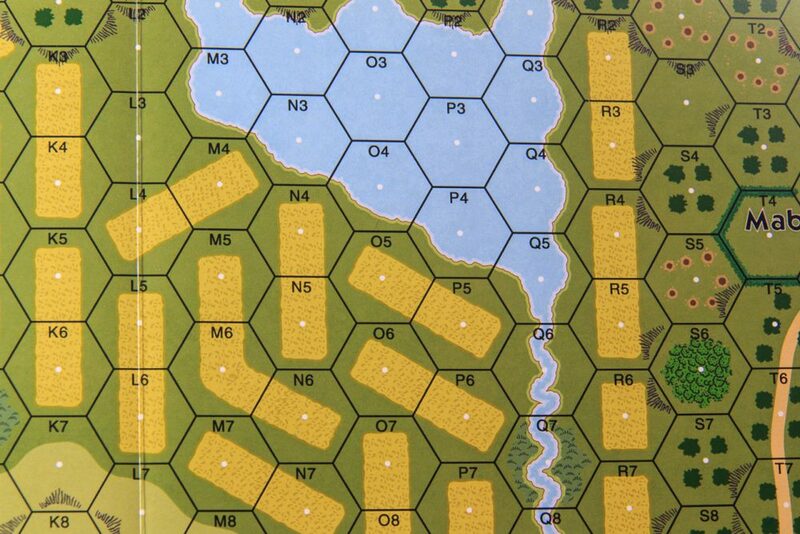 The large, all-map scenario is MBL#8 (On the Road to Abucay), depicting a major Japanese attack. The intense, 7-turn scenario features 29 Japanese squads, 5 crews, 8 leaders, and 2 tanks (plus a ton of SW) on the attack, later reinforced by 10 more squads and 8 more tanks. The Japanese also get Air Support and a100mm OBA. The defending Fil-Americans have 20 squads, 6 guns, and tons of fortifications; they too are reinforced, with 8 squads and 2 AFVs. They get 100mm OBA, too. To win, the Japanese must clear the Americans from the major part of the playing area, or inflict substantial casualties. Overall, MBL looks like a decent product, featuring a unique situation not seen in any earlier HASLs and a good mix of scenarios. With few special rules, it is easy to get into and play as well. It is a shame, though, that it comes with no campaign game. Nevertheless, fans of the PTO will definitely want to obtain this product. 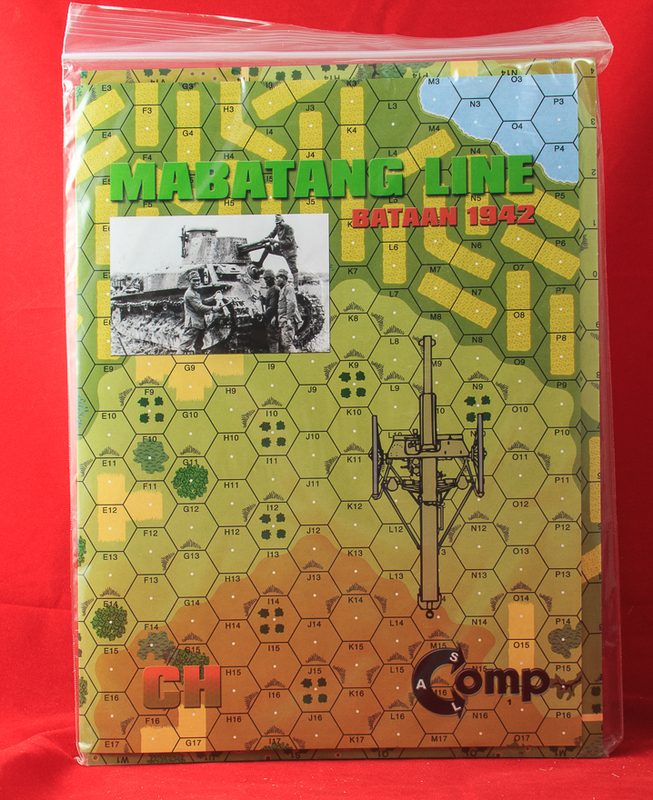 2nd Edition (Mabatang Line) comments: Mabatang Line is the renamed and rereleased 2nd edition of this product, an inevitable eventuality, considering Critical Hit’s business model. It is virtually the same as the first edition with the exception of the map. Though the artwork on the map is the same as the 1st edition, the physical form it takes definitely is not. 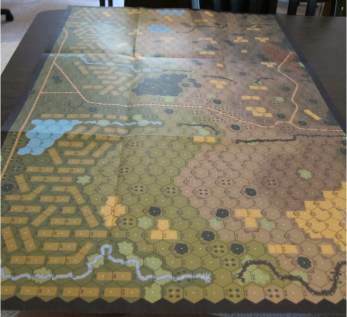 Gone is the mapsheet; in its place are 6 12″ x 18″ heavy paper glossy map panels that must be assembled to form the playing area (and it is kind of a pain to assemble these when there are more than 4 of them). However, the panels provide a bit more color. Other than that, changes are minor. The scenario cards and rules have some color to them, but the scenarios have no version numbers on them, so are probably unchanged in content from the originals. The counters are also the same as in the 1st Edition. Critical Hit’s website’s marketing copy claims that there are 274 die-cut counters but Critical Hit does not know how to count; there are 296 die-cut counters (2 duplicate half-sheets of 148 counters). There really is nothing better or worse about this edition than the original edition, so either one is suitable.